Organic search makes up only 13%, but direct traffic – 86% of total visitors. It should be other way around. There is a very sudden traffic spike – going from to 0 visits on August 9th to 32035 visits next day. While organic search is growing relatively slowly from 468 to 10k+ visits per day, direct traffic just goes up to 30k+ visits from 0. You could explain the last 2 things with a case, where site was active for a long time, and Google Analytics code was added only on August 10th, but 86% direct traffic seems very unusual, so we need to check other reports as well. Lets look at browsers – Internet Explorer dominates with almost 89%. Hard to believe that taking into account usage share of browsers. Only 2.28% of traffic is coming from mobile, should be higher. Only 0.09% support Java, but if I look at stats from sites with real visitors – then Java support is around 75%. After checking these reports – it seems to me, that bots can fake organic traffic, and probably could easily fake stats about browser, mobile and Java usage, but they cannot fake the their IPs and networks to which they belong. 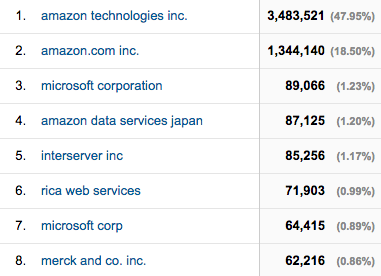 So as long as these bot networks use Amazon Web Services, Microsoft Azure and other cloud computing services, they will be easy to recognize, if you look at the right report (Audience > Technology > Networks). 2 weeks ago a new gaming site oyunsokagi.com signed up for GetGamers – and started sending us a lot of low quality traffic. We blocked their account and asked to provide access to Google Analytics so we could investigate it more. As I went through several reports, it was easy to see some unusual stats. 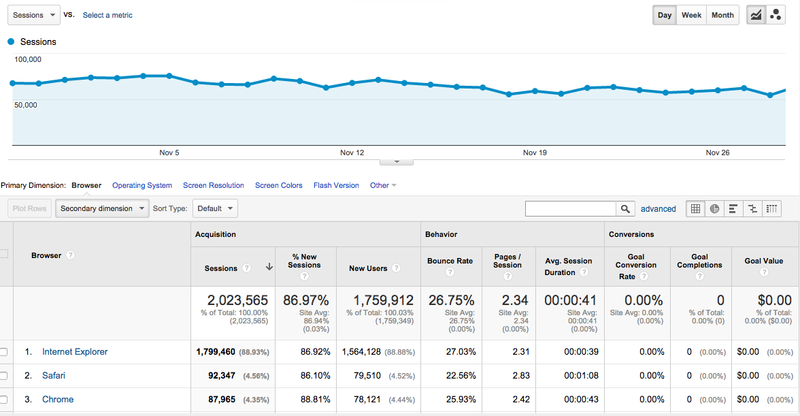 In this screen – you can see that on November 10 website had only 2.2k sessions, but only couple of days later – around 800k. 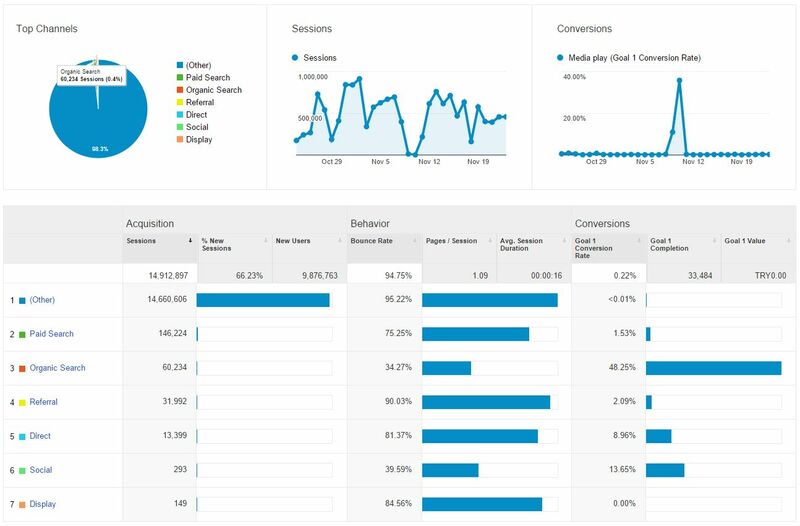 Other indicators – low session duration (only 16 seconds) and high bounce rate (94.75%) also show that the traffic is fake or so irrelevant that visitors don’t spend any time in the website. Lets have a look at traffic sources – sites with similar content usually would get most of their visitors from organic search, but in oyunsokagi.com case – 98.3% is coming from “(Other)”. The only 2 channels with bounce rate below 50% are Organic Search and Direct Traffic – but together they make less than 1% of traffic. Another unusual thing – the site is in Turkish language, but according to their GEO report – Turkey is only nr. 21 in the top country list. And while Turkey has 65% bounce rate, all other countries have bounce rates of 90% or higher. So where does this publisher gets his traffic then? Buys from cheap ad networks that don’t care about traffic quality (and probably are exploited by publishers using bots) and then tries to sell it to gaming ad networks. We blocked the site after 1 day and got following reply from site owner: “It’s a shame of you, i have conversions on other networks and making decent amount of money from them.” – so this approach is working with other ad networks, but I guess that their advertisers will not be happy with the results. 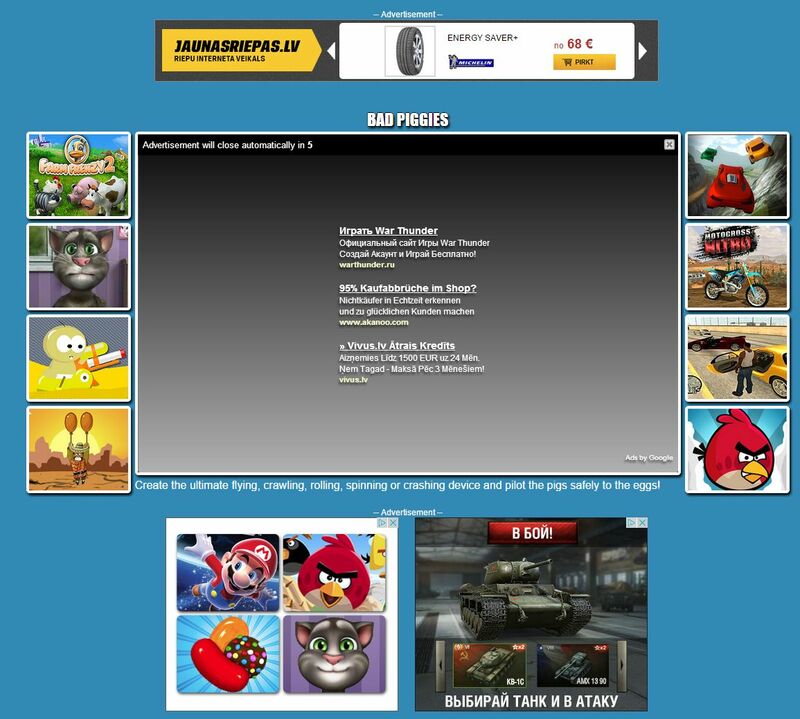 Channel – we got visitors from doregama.info, forum.arabia4serv.com, surk.tv – sites that are in no way related to gaming, and surk.tv had inserted 1x1px iframes and loaded invisible ads for their visitors. There was a big fuckup from Headway Digital, but we could also see how some sites try to increase impressions served by loading multiple ads in iframes. This way their visitors don’t even see the ads, and they can “show” more impressions and get more earnings as long as no one complains. In this case we got a refund for our campaign, but advertisers that don’t go into such details as checking referrers (or don’t have this info available), can just waste their money. 5-10 years ago you could buy CPC ads from Google, send traffic to your own website, place Google AdSense ads there and make the content so bad/non-existent, that the only option for site visitor is to click on the ad. There were thousands of cases like these, and 800k advertisers got banned. 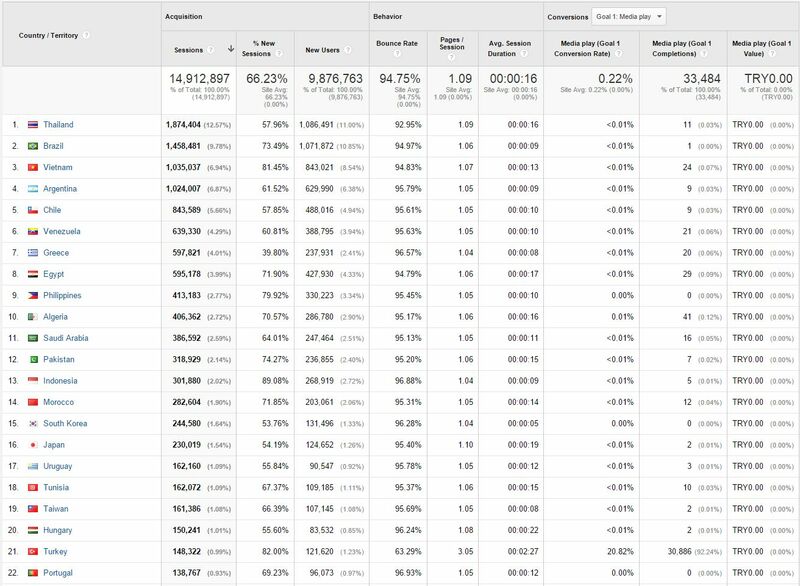 At GetGamers we have had similar advertisers – that buy traffic, then send it to their gaming sites that are full of ads, and somehow make more money from these ads than they spend on traffic. Couple of times we have received offers from advertisers that were willing to run campaigns with large budgets, but only with Net30 payment terms – meaning that they would pay us only after receiving the traffic. Some even offered references, but as I had already heard some stories about the wild west in internet ad sales by Artis, Ask.fm head of advertising – then it was easy for me to avoid falling into this trap. These offers are unusual because the standard practice is following – either the advertiser is careful when launching campaigns in a new ad network and would want to start with a very small budget, or advertiser would offer revenue-share in which case they don’t risk at all. I am writing to you on behalf of Amdelia Ad Network, specialising on running ad campaigns for direct clients. We are running now a banner campaign with a monthly budget of $20K. Are you able to offer us any inventory? We are ready to consider any your offers or suggestions. Can we run our campaign at $3.00 CPM with a budget of $15K per month for 3-4 months? Please let me know if it’s possible and if yes – just send me an IO and let’s get started! We are working with Net30 terms only and we would like to sign an IO for $15K per month for 3-4 months. Is this possible? We don’t work with prepayment, only Net30. Please let me know if these payment terms are possible. If not – we will have to refuse unfortunately. I tried to find out something more about the company or Trace Stevens, but besides their website there was almost zero online presence elsewhere. I replied that we don’t send free traffic, and that is how the conversation ended. The scheme for these kind of guys is following – set up big campaigns and run them for as long as they can without any payment, and then disappear after a while, create a new site and do it all over again. Most likely they would not advertise their own product/service, but send traffic to a website with ads placed from other ad networks. 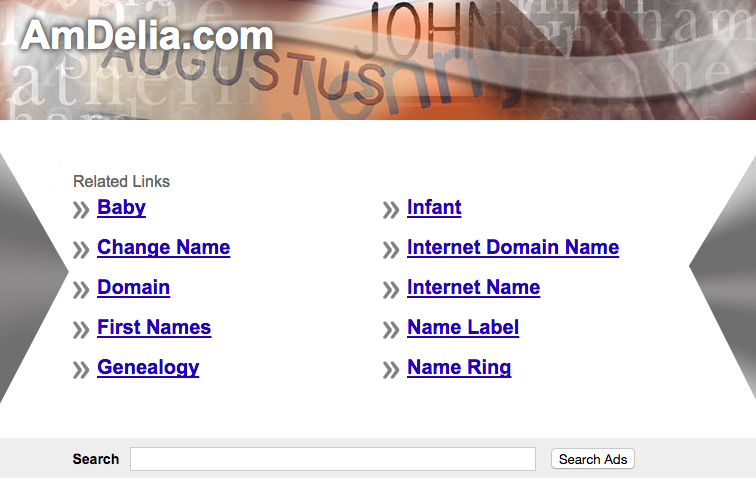 This way one ad network or big publisher sends them free traffic, and they monetize it with help of another ad network.